Submitted by Norm Roulet on Fri, 10/06/2006 - 13:34. 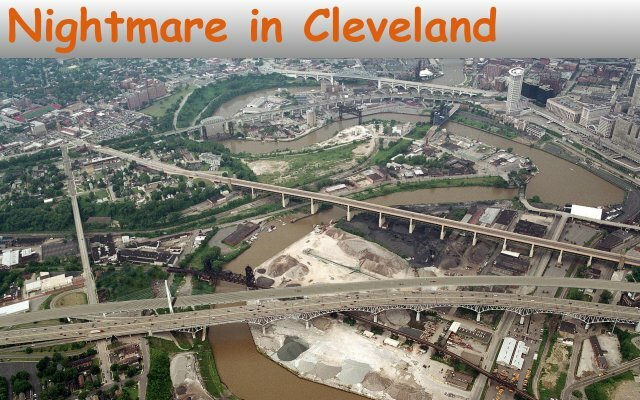 In 2020 - the year, and with such vision - what postcard do you want to send from your hometown of Cleveland... the "Cleveland of my Dreams" vision above, or the the toxic "Nightmare in Cleveland" reality planned for us by ODOT, below, which is planned to be worse than anyone ever imagined. By 2020, ODOT plans to blight the entire dream zone of the Cleveland Flats and the East and West banks of the Cuyahoga River Valley shown in these renderings, and surrounding neighborhoods, even worse than they and the port have blighted there today. By 2020, ODOT will have finished their slash of concrete and steel rendered in the nightmare reality below, destroying these opportunity zones as freeways have destroyed so much else in NEO. Read on to see how we may be able to make these mightmare visions dreamy, instead. NEO Mainstreet founder, Cleveland Institute of Art design graduate and current Kent State University Cleveland Urban Design Collaborative planning masters student Joseph Stanley has a more intelligent design for the future of Cleveland than the leaders of our community have embraced - Joseph sees Cleveland becoming a livable city of walkable neighborhoods and great public transportation leading to a vibrant economy desirable to all intelligent people of the world - a world class city rising up from the blight created by so many generations of greed and ignorance. Picture the rendering above versus the reality embraced by NEO leadership below, as discussed throughout the NEO Signature Bridge area of REALNEO. If you could live in a place like shown above... a Cambridge... would you? Would this be a place for your children to settle... would this attract the next generation of knowledge workers and new economy leaders? Or, are you counting on everyone in NEO wanting to live in Crocker Parks, driving polluting cars for hours each day, and finding their arts and culture in the exurbs? Be real... what do you see for your children's futures?... An out-of-date, old-fashioned ranch home isolated on 6 acres in Medina or a cool, energy efficient, glassy loft overlooking the Cuyahoga River, in a vibrant walkable community... what do you want for yourself in your old age, and even now? Do you really think the picture below is a better plan for your community... for your Flats... for your Cuyahoga River Valley... for Northeast Ohio? Submitted by Evelyn Kiefer on Fri, 10/06/2006 - 23:04. Joseph Stanley's drawing is a real eye-opener! Its about as polar opposite as you can get from the hideous reality of what that area looks like now + the pathetic proposed bridge. Maybe seeing is believing -- if more NEO residents can see Joseph's vision maybe they will care how we develop our city and get behind a plan for something better than what ODOT has to offer. I like how Joseph's drawing has a blue river, lets include ousting Mittal and cleaning up our river, lake and air with this plan. Submitted by Norm Roulet on Fri, 10/06/2006 - 23:26. I asked Joseph Stanley to create this image for a post card of what Cleveland could look like at its best, and he did an amazing job. This postcard idea came from an Excellence Roundtable many months ago, when someone suggested we do exactly this. It is time to print 1,000s of these - a bifold with Joseph's image on the outside, and the ODOT/NEO leadership reality on the inside, and mail them around the world and let others decide for those who have no vision of intelligent design. I'll see if Jaks prints will donate the printing... update to come. Submitted by Norm Roulet on Sat, 10/07/2006 - 00:59. I've emailed a realneo member from jakprints about printing up a postcard package for a "Postcards from Cleveland" project. We produce a trifold perforated mailer with Joe Stanley's postcard as one panel, the ODOT postcard as a second panel and a cover panel with space for the mailing address and stamp on one side and an explanation of the purpose of the mailer on the other. We would need volunteers to agree to mail these packets to people they know would be interested - the more broadly outside of NEO and influential the better - architects and planners and mayors and journalists around the world - and we would be asking the recipients to mail them back to a designated recipient with their comments on each of the Stanley and ODOT designs - we'll provide additional supporting information and on-line forums, polls, etc. on REALNEO or NEO Bridge as well. The objective would be to get as many powerful responses to the right person as possible. Who would be the right person? It would have to be someone who would agree to make all the responses available to the public - perhaps Cuyahoga Planning Director Paul Alsenas, Plain Dealer Architecture Critic Steven Litt, or Cleveland Mayor Frank Jackson... certainly not anyone at ODOT, who would throw away the public opinion. I'll keep you posted - interested to help, post here. Submitted by Norm Roulet on Wed, 10/18/2006 - 15:16. Wow - exciting news in the PD today - ODOT has put the whole Interbelt planning disaster on hold... only took them $ millions in public dollars and strong community opposition (albeit by only a small segment of the community) to figure out they were on the wrong track. Punishment against the community... they are pulling the idea of a bike path off the table! What babies. Hopefully, by the time the final plans are drawn, we'll have a new government in place at every level in America and Americans will get good outcomes from ODOT... now we have time for that to happen. A few last obsevations on this at this time. ODOT staff should lose their jobs, and their consultants should lose their contracts and pay back the people. Citizens should start caring more about their community, as they may make a difference. And, the PD should start covering such issues with more intelligence. Just read the first paragraph of their sprawl mongering approach to covering this news and consider, what message are they sending the people of NEO... " Commuters can expect an extra year or two of traffic snarls on the Inner Belt and continued danger at Dead Man's Curve, the most perilous stretch of highway in Ohio." Give me a break... try taking public transportation, staggering work start times and moving into the city. Developing story: Sonic booms, nuclear event, and earthquake outside Chicago, U.S.